Not to be confused with Goa. For other uses, see Gao (disambiguation). 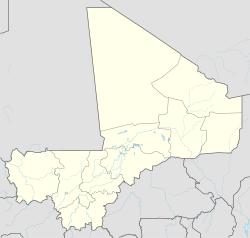 Gao /ɡaʊ/ is a city in Mali and the capital of the Gao Region. The city is located on the River Niger, 320 km (200 mi) east-southeast of Timbuktu on the left bank at the junction with the Tilemsi valley. For much of its history Gao was an important commercial centre involved in the trans-Saharan trade. In the 9th century external Arabic writers described Gao as an important regional power and by the end of the 10th century, the local ruler was said to be a Muslim. 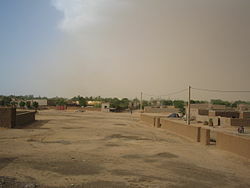 Towards the end of the 13th century Gao became part of the Mali Empire, but in first half of the 15th century the town regained its independence and with the conquests of Sunni Ali (ruled 1464–1492) it became the capital of the Songhai Empire. The Empire collapsed after the Moroccan invasion in 1591 and the invaders chose to make Timbuktu their capital. By the time of Heinrich Barth's visit in 1854, Gao had declined to become an impoverished village with 300 huts constructed from matting. In 2009, the urban commune had a population of 86,633. Gao is located on the eastern bank of the Niger River at the junction with the Tilemsi Valley. The sprawling town is the largest in eastern Mali. It is connected to the capital, Bamako at the western end of Mali, by 1200 km (750 mi) of paved road. In 2006, the Wabaria bridge was inaugurated to replace the ferry service across the Niger. The bridge was constructed by the China State Construction Engineering Corporation and financed by the Islamic Development Bank and the Malian government. The town is strategically located with road links (unpaved) to the desert Kidal Region to the north and to Niamey, the capital of Niger, to the south. The road to the south runs along the left bank of the river. The town of Ansongo is 103 km (65 mi) from Gao. The border with Niger is just south of the village of Labbezanga, a distance of 204 km (127 mi). There are also seasonal ferry services on the Niger River. A service between Gao and Koulikoro, a distance of 1380 km (860 mi), is managed by the Compagnie Malienne de Navigation (COMANAV). It usually operates from the end of July, after the annual rains when there is sufficient water in the river, until mid November. Smaller boats are able to operate for a longer season between Bourem and Ansongo. Gao features an arid climate under Köppen's climate classification. Gao's climate is hot and dry, with the only rainfall occurring between June and September. August is normally the wettest month. The average annual rainfall is only 220 mm, but there are large year-to-year variations. May is the hottest month, with an average maximum temperature of 43 °C. December and January are the coolest months, with minimum temperatures of 15 °C. From October to March during the dry period, the north-easterly Harmattan wind blows from the Sahara. When it blows strongly the dust-laden wind reduces visibility and creates a persistent haze. With the low rainfall the vegetation away from the river is sparse and consists mainly of various species of Acacia (Acacia raddiana, Acacia nilotica, Acacia ehrenbergiana) and Balanites aegyptiaca. The herbaceous plants are dominated by Cenchrus biflorus and Panicum laetum. Almost all the local agriculture depends on river water for irrigation. The annual flood of the Niger River is a result of the heavy rainfall in the headwaters of the Niger and Bani rivers in Guinea and the northern Ivory Coast. The rainfall in the headwater areas peaks in August but the flood water takes time to pass down the river system, through the Inner Niger Delta region and arrive at Gao. At Koulikoro the flood peaks in September, while in Gao the flood lasts longer and reaches a maximum in December. There is a large year-to-year variation in the extent of the flooding. The existing and proposed dams upstream of Gao reduce the overall flow of the river and could potentially have a large effect on the local agriculture. When in flood the river is 4 km wide at Gao but during the dry season a number of islands appear in the river. There is very little flow, only 5% of the maximum, in June and July. The history of the Gao Empire precedes that of the Songhay Empire in the region of the Middle Niger. Both empires had the town of Gao as their capital. Apart from some Arabic epitaphs on tombstones discovered in 1939 at the cemetery of Gao-Saney (6 km to the east of the city) there are no surviving indigenous written records that date from before the middle of the 17th century. Our knowledge of the early history of the town relies on the writings of Arabic geographers living in Morocco, Egypt and Andalusia, most of whom never visited the region. These authors referred to the town as Kawkaw or Kuku. The two key 17th century chronicles, the Tarikh al-Sudan and the Tarikh al-fattash, provide information on the town at the time of the Songhay Empire but they contain relatively little on the social and economic history. The chronicles do not, in general, acknowledge their sources. Their accounts for the earlier periods are almost certainly based on oral tradition and for events before the second half of the 15th century they are likely to be less reliable. For these earlier periods, the two chronicles sometimes provide conflicting information. There is the kingdom of the Kawkaw, which is the greatest of the realms of the Sūdān, the most important and most powerful. All the kingdoms obey its king. Al-Kawkaw is the name of the town. Besides this there are a number of kingdoms of which the rulers pay allegiance to him and acknowledge his sovereignty, although they are kings in their own lands. Their king pretends before his subject to be a Muslim and most of them pretend to be Muslims too. He has a town on the Nile [Niger], on the eastern bank, which is called Sarnāh, where there are markets and trading houses and to which there is continuous traffic from all parts. He has another town to the west of the Nile [Niger] where he and his men and those who have his confidence live. There is a mosque there where he prays but the communal prayer ground is between the two towns. The archaeological evidence suggests that there were two settlements on the eastern bank of the Niger: Gao Ancien situated within the modern town, to the east of the Tomb of Askia, and the archaeological site of Gao-Saney (Sané in French) situated around 4 km to the east. The bed of the Wadi Gangaber passes to the south of the Gao-Saney occupation mound (tell) but to the north of Gao Ancien. The imported pottery and glass recovered from Gao-Saney suggest that the site was occupied between the 8th and 13th centuries. It is possible that Gao-Saney corresponds to Sarnāh of al-Muhallabi. Al-Bakri writing in 1068 also records the existence of two towns, but al-Idrisi writing in around 1154 does not. Both al-Muhallabi (see quote above) and al-Bakri situate Gao on the west (or right bank) of the Niger. The 17th century Tarikh al-fattash also states that in the 10th century Gao was situated on the Gourma side (i.e. the west bank) of the river. A large sand dune, La Dune Rose, lies on the west bank opposite Gao, but at Koima, on the edge of the dune at a site 4 km north of Gao, surface deposits indicate a pre 9th century settlement. This could be the west bank Gao mentioned by 10th and 11th-century authors. The site has not been excavated. Towards the end of the 13th century Gao lost its independence and became part of the expanding Mali Empire. What happened to the Zuwa rulers is not recorded. Then I travelled to the town of Kawkaw, which is a great town on the Nīl [Niger], one of the finest, biggest, and most fertile cities of the Sūdān. There is much rice there, and milk, and chickens, and fish, and the cucumber, which has no like. Its people conduct their buying and selling with cowries, like the people of Mālī. On 31 March 2012, one day after the capture of Kidal, Malian military forces retreated from Gao's military bases, allowing it to be occupied by Tuareg rebellion member groups MNLA and Ancar Dine. Timbuktu was captured the following day. On 6 April, the MNLA declared the region independent of Mali as the nation of Azawad. After the Battle of Gao on 26 and 27 June 2012, the MNLA lost control to Islamist militias. After the 2012 rebellion forced the Malian Army out of Gao and the state of Azawad was proclaimed, the National Movement for the Liberation of Azawad took control of the governor's building, flying the flag of Azawad over it and rechristening it the Palace of Azawad. On 26 June 2012, the tension came to all-out combat in Gao between the MNLA and MOJWA, with both sides firing heavy weapons. MNLA Secretary General Bilal ag Acherif was wounded in the battle. The MNLA were soon driven from the city, and from Kidal and Timbuktu shortly after. However, the MNLA stated that it continued to maintain forces and control some rural areas in the region. The following day, Ansar Dine announced that it was in control of all the cities of northern Mali. On 19 January 2013, it was reported that Gao journalist Kader Toure was killed after being suspected of working for foreign news services. In retaliation, the local youth are reported to have lynched Islamic police commissioner Aliou Toure who was recruited by MUWA, Movement for Oneness and Jihad in West Africa, who took control of the town in June 2012. In January 2013 French warplanes bombed parts of Gao, including the airport, in an attempt to drive out fighters from the Movement for Unity and Jihad in West Africa. Gao was captured by French and Malian forces on 26 January 2013, as the Islamists were driven out from the city. On 18 January 2017, a suicide bomber from Al-Mourabitoun drove a vehicle filled with explosives into a military camp near Gao, Mali, killing several dozen people. The incident is the deadliest terrorist attack in Malian history. The population of Gao mostly speak Songhay but includes many ethnicities, including the Bozo (traditionally nomadic river dwellers), Fulfulde/Fulani cattle keepers, and Tuareg nomads, Arabs as well as Bambara peoples from western Mali. The seventh Festival des arts et cultures songhay was celebrated in February 2007 at Gao, reflecting the city's importance as a Songhay cultural capital. Attractions in Gao include the original fourteenth century Gao Mosque, the Askia Tomb (a UNESCO World Heritage Site) built in 1495 and incorporating another mosque, a museum devoted to the Sahel, markets including a night market, and La Dune Rose, a sand dune named after its appearance at dawn and nightfall. ^ Levtzion, Nehemia (1973). Ancient Ghana and Mali. New York: Methuen & Co Ltd. p. 3. ISBN 978-0-8419-0431-6. ^ a b "Tuareg rebels declare the independence of Azawad, north of Mali". Al Arabiya. 6 April 2012. Retrieved 6 April 2012. ^ "Tuaregs claim 'independence' from Mali". Al Jazeera. 6 April 2012. Retrieved 6 April 2012. ^ Mali: French-led soldiers 'in control of Gao', BBC News, 26 January 2013, retrieved 26 January 2013 . ^ Plan de Securite Alimentaire Commune Urbaine de Gao 2005–2009 (PDF) (in French), Commissariat à la Sécurité Alimentaire, République du Mali, USAID-Mali, 2005, archived from the original (PDF) on 26 July 2011, retrieved 30 January 2011 . ^ "World Weather Information Service – Gao". World Meteorological Organization. Retrieved 12 October 2015. ^ "Gao Climate Normals 1961–1990". National Oceanic and Atmospheric Administration. Retrieved 12 October 2015. ^ Composite Runoff Fields V 1.0: Koulikoro, University of New Hampshire/Global Runoff Data Center, retrieved 30 January 2011 . ^ Composite Runoff Fields V 1.0: Ansongo, University of New Hampshire/Global Runoff Data Center, retrieved 30 January 2011 . ^ Zwarts, Leo (2010), Will the Inner Niger Delta shrivel up due to climate change and water use upstream? A&W Report 1537. Commissioned by Wetlands International (PDF), Feanwâlden, The Netherlands: Altenburg & Wymenga . ^ Levtzion & Hopkins 2000, p. 1. ^ Hunwick 2003, p. xxxviii. ^ Hunwick 2003, pp. lxiii–lxiv. ^ Levtzion & Hopkins 2000, p. 7. ^ Levtzion & Hopkins 2000, pp. 27, 378 n4. ^ Levtzion & Hopkins 2000, pp. 45, 51, 382 n21. ^ Levtzion & Hopkins 2000, p. 174. ^ Cissé et al. 2013. ^ Insoll 1997, p. 23. ^ Levtzion & Hopkins 2000, p. 87. ^ Levtzion & Hopkins 2000, p. 113. ^ Levtzion & Hopkins 2000, p. 85. ^ Insoll 1997, pp. 4–8. ^ Hunwick 2003, pp. xxxv, 5. ^ Levtzion 1973, p. 76. ^ Hunwick 2003, p. xxxvi. ^ Battutah, Ibn (2002). The Travels of Ibn Battutah. London: Picador. pp. 286–290. ISBN 9780330418799. ^ Levtzion & Hopkins 2000, p. 300. ^ Hunwick 2003, p. xxxvii. ^ Lange 1994, p. 421. ^ Hunwick 2003, p. 283. ^ Hunwick 2003, p. xlix. ^ Kâti 1913, p. 262. ^ Barth 1859, p. 481. ^ Barth 1859, p. 482. ^ "Mali Tuareg rebels seize key garrison town of Gao". BBC News. 31 March 2012. Retrieved 31 March 2012. ^ Rukmini Callimachi (1 April 2012). "Mali coup leader reinstates old constitution". Associated Press. Retrieved 31 March 2012. ^ "Mali: Islamists seize Gao from Tuareg rebels". BBC News. 28 June 2012. Retrieved 28 October 2012. ^ "Malians protest against Azawad independence". The Telegraph. 6 April 2012. Retrieved 6 April 2012. ^ "Residents in northern Malian town lynch Islamist: sources", Chicago Tribune, 19 January 2013, retrieved 26 January 2013 [permanent dead link]. ^ "French planes bomb airport in Mali". 3 News NZ. 14 January 2013. Archived from the original on 29 January 2013. Retrieved 13 January 2013. ^ "Two die in Dutch UN helicopter crash". BBC News. 2015-03-17. Retrieved 2018-03-03. ^ Bumiller, Elisabeth (17 January 2013). "Jihadist Kingpin Suspected in Hostage Seizure". The New York Times. Algeria;France;Mali. Retrieved 24 January 2013. Barth, Heinrich (1859), Travels and discoveries in North and Central Africa: Being a journal of an expedition undertaken under the auspices of H.B.M. 's government, in the years 1849–1855 (Volume 3), New York: Harper & Brothers . Cissé, M.; McIntosh, S.K. ; Dussubieux, L.; Fenn, T.; Gallagher, D.; Chipps Smith, A. (2013), "Excavations at Gao Saney: new evidence for settlement growth, trade, and interaction on the Niger Bend in the first millennium CE", Journal of African Archaeology, 11 (1): 9–37, doi:10.3213/2191-5784-10233 . Hunwick, John (1994), "Gao and the Almoravids revisited: ethnicity, political change and the limits of interpretation", Journal of African History, 35 (2): 251–273, doi:10.1017/s0021853700026426, JSTOR 183219 . Hunwick, John O. (2003), Timbuktu and the Songhay Empire: Al-Sadi's Tarikh al-Sudan down to 1613 and other contemporary documents, Leiden: Brill, ISBN 978-90-04-12560-5 . First published in 1999 as ISBN 978-90-04-11207-0. Insoll, Timothy (1997), "Iron age Gao: an archaeological contribution", Journal of African History, 38 (1): 1–30, doi:10.1017/s0021853796006822, JSTOR 182944 . Lange, Dierk (1991), "Les rois de Gao-Sané et les Almoravides", Journal of African History (in French), 32 (2): 251–275, doi:10.1017/s002185370002572x, JSTOR 182617 . Lange, Dierk (1994), "From Mande to Songhay: Towards a political and ethnic history of medieval Gao", Journal of African History, 35 (2): 275–301, doi:10.1017/s0021853700026438, JSTOR 183220 . Levtzion, Nehemia (1973), Ancient Ghana and Mali, London: Methuen, ISBN 978-0-8419-0431-6 . Moraes Farias, Paulo F. de (1990), "The oldest extant writing of West Africa: medieval epigraphs from Essuk, Saney, and Egef-n-Tawaqqast (Mali)", Journal des Africanistes, 60 (2): 65–113, doi:10.3406/jafr.1990.2452 . Link is to a scan on the Persée database that omits some photographs of the epigraphs. Sauvaget, J. (1950), "Les épitaphes royales de Gao", Bulletin de l'Ifan, XII (2): 418–440 . A reprint of (1949), Al-Andalus XIV: I, 123–141. Cornevin, R. (1991), "Gao", Encyclopaedia of Islam Volume 2 (2nd ed. ), Leiden: Brill, pp. 976–978, ISBN 978-90-04-07026-4 . First published in 1965. Mauny, Raymond (1951), "Notes d'archéologie au sujet de Gao", Bulletin de l'Institut Français d'Afrique Noire (B) (in French), 13: 837–852 . Moraes Farias, P.F. de (2003), Arabic medieval inscriptions from the Republic of Mali : Epigraphy, chronicles and Songhay-Tuareg history, Oxford: Oxford University Press, ISBN 978-0-19-726222-1 . Wikimedia Commons has media related to Gao. Tomb of Askia, UNESCO World Heritage .